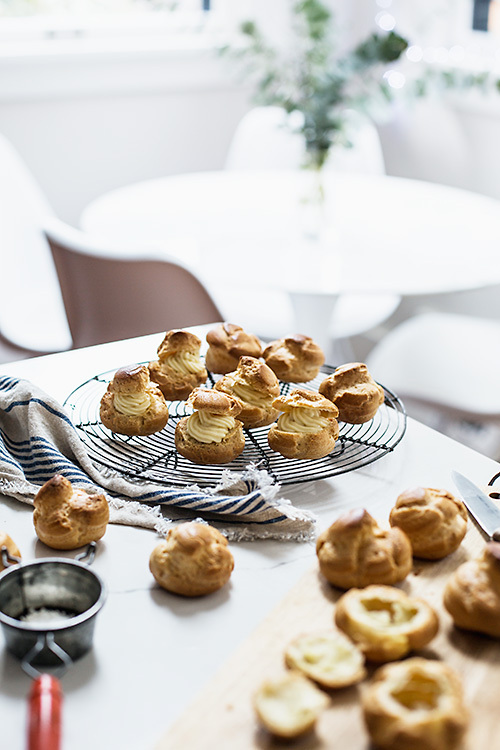 Cream puffs were one of my favorite desserts growing up in Japan. 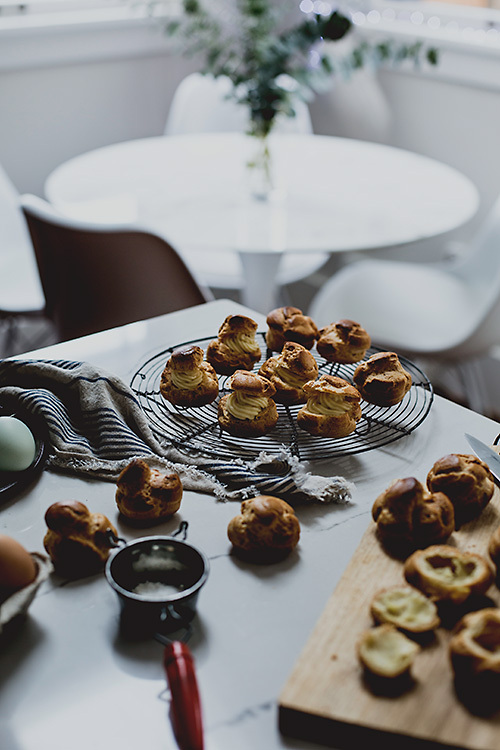 French pastries are very common and pretty good in Japan and they are called Choux Creme (shoe-cree-mu). I don't often make this because the amount of eggs I have to use sometimes put me off a little bit, but once in a while it's a great teat to make. I made it finally because my kids kept requesting it. 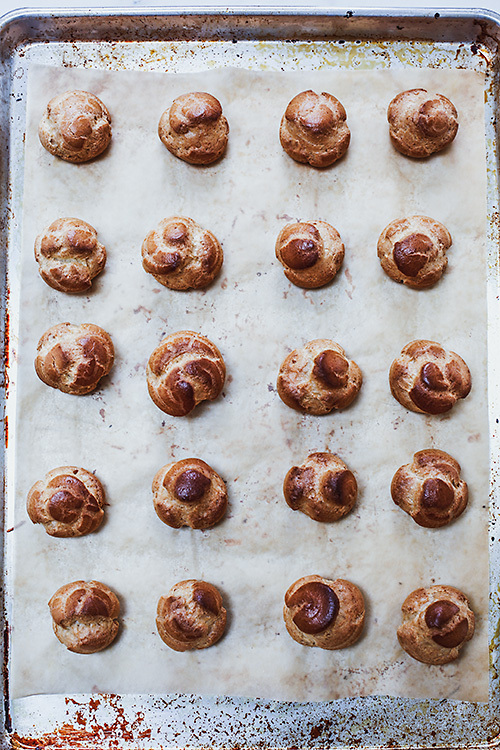 Choux/puffs look like a complicated thing to make because dough have to puff up with space in the middle, but it's really easy if you follow the steps correctly. You just melt a stick of butter in a pan, combine it with flour and stir until it doesn't stick on the pan anymore with low heat. Then blend the dough mixture with eggs in the food processor. That's it! Cream puffs I find here in the States are often filled with whipped cream, but I like mine with custard cream. Custard is also very easy to make, just have to be cautious while staring over the heat to make it smooth. To make chop, bring a cup of water to boil in a sauce pan and melt 1 stick of butter in. Turn the heat down to low and add a cup of flour and stir quickly by folding from the bottom until it forms the dough and dough is smooth and does't stick on the pan for about 3 minutes. Let the dough cool down. Preheat the oven at 400 ˚F / 200˚C. Place parchment paper on a large baking sheet. In a food processor, add 5 eggs and dough and mix until it's smooth. 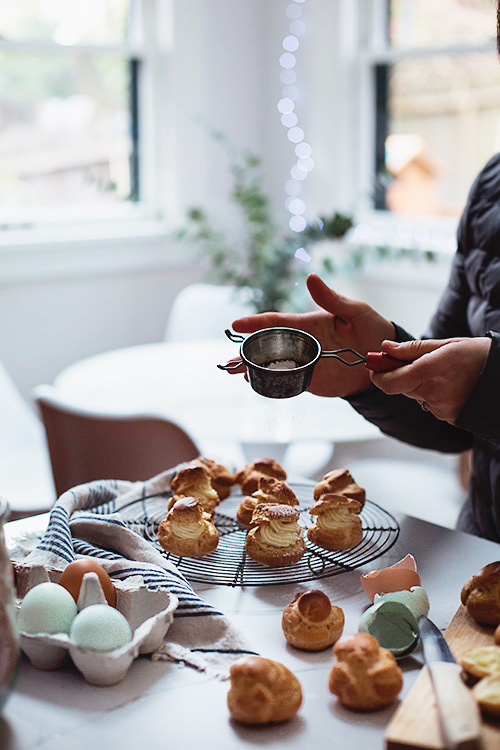 Pour the choux dough in a piping bag. Pipe out small mounds of dough about an inch round. Make sure to lave enough space around each other (as shown on the photos) as they puff up double the size of the dough. Bake it in the over for about 20-25 minutes until they are golden brown. Take them out of the over, poke tiny hole at the bottom of each one to let the moisture escape and let them cool down. To make custard for filling, warm up 2 cups of milk. Make sure it's warm but not hot so that egg won't become lumpy. 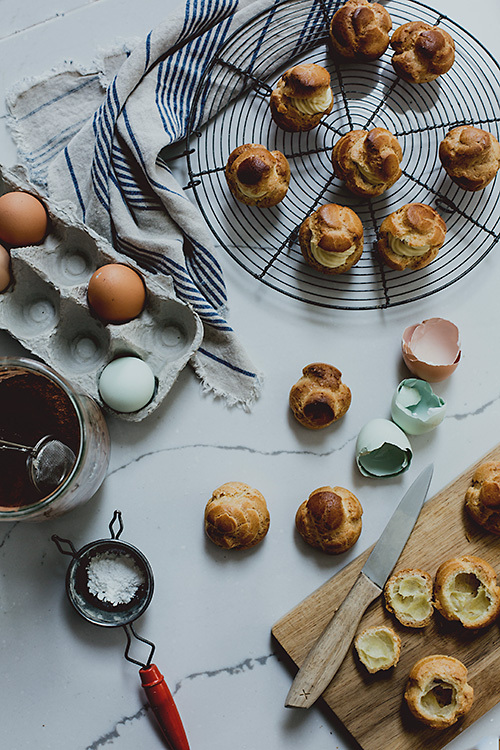 Combine sugar, egg yolks, vanilla extract, salt and cornstarch in a bowl. Pour warm milk slowly into the bowl a few separate times and stir well each time. Put the custard mixture in a sauce pan and back on the low-medium heat. Stir with spatula constantly and avoid forming lumps. Stop stirring once the mixture is thick like custard after 3 mites or so. Be careful not to over cook. (*If you overcooked it and see lumps, you can't the custard in a blender or food processor to smoothen it. 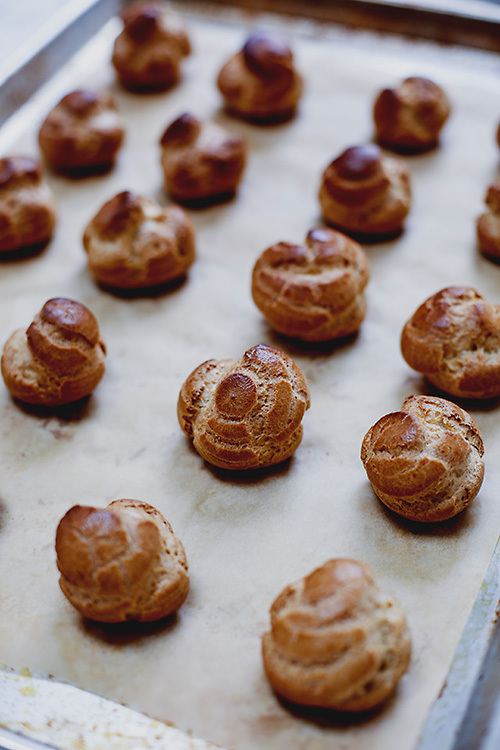 Cut choux puff in half and start piping custard inside. Put the custard in a piping bag after it's cooled down. I did it this way but you can also make a little hole at the bottom and stuff custard in from there.